And it works! It worked so well, in fact, that now I want to sew it over and over again (this happens to me a lot — when I have a hammer, everything looks like a nail). So we can consider the concept as proved, and move on to implementation. It actually went together wonderfully; all the seams matched without too much tsuris, and I only had to resort to the first tier of expletives to get the zipper in. I did forget to put a pocket in the side skirt seam, but that's an easy alteration on this dress as it has a back zip, not a side one. I let out the side seams by 2/3 inch, total, and it fits EXACTLY. I'm still not sold on the color of this dress (is it orchid? lavender? ashes of roses?) even though I wore this on television (!, and no, it wasn't for Dress A Day) last night, with a yellow vee-neck cardigan sweater. I'm thinking I might have looked like a big Easter egg, but I'm too chicken (no pun intended) to go watch the TiVo and see. Even though I made it up in a solid, I think this is really a pattern for prints, if I can match the skirt seams well. The large expanse across the bodice is better for showing off a gorgeous print than a fussy vee, collared, or buttoned neckline would be. And after I finish making up the car print, I have another one in mind …. I wonder how many of these I can make before it gets silly? When the automobile-print dress is finished, can I borrow it for the next time I volunteer to promote I-Go, Chicago’s car-sharing service? I’ve got one skirt pattern (Burda 8677 – highly recommended) with a waist yoke and just enough twirl in the skirt to feel 50s full that I’ve made it… omigosh… 11 times… Is that excessive? One is out of a cotton twill william morris tablecloth I picked up for 50pence in a junk shop and i always get great comments! 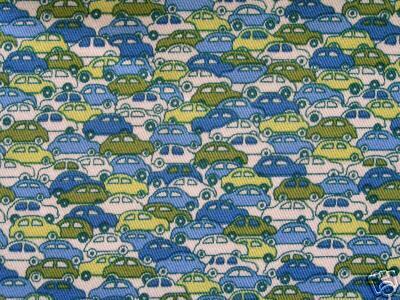 Talk about value for money!Gorgeous car fabric, btw, where did you find it? Beautiful dress, Erin. IIRC ashes of roses was a little peachier. I’d go with orchid. Lovely! And no easter-egg worries necessary. If that color were in a catalog, it would probably be called either something cheesy like “whisper orchid” or something jarring like “hypothermia,” depending on whether it was “Blair” or “Hot Topic.”The car fabric reminds me of a Richard Scary book, which is a very good thing because I love Richard Scary’s illustrations.Lydia, I love your idea for a contrast-band: I’m learning that those sometimes give me the waist I don’t really have!And Helen, you’re a woman after my own heart: I’m always scouting thrift shops for old sheets or tablecloths to use in making other things. I’ve got a vintage tablecloth my grandmother gave me (white w/bright red geraniums & green leaves), and I’ve hesitated to use it on the table because my children will promptly [and permanently] desecrate it with Jell-o and macaroni & cheese. Maybe I’ll make a fabulous skirt out of it! I mean, it shouldn’t just sit inside a dark storage-box. At least this way I could really enjoy it. Grandma made absolutely everything she wore and used every last scrap in her pieced quilts, so she’d definitely approve.BTW, contratulations Erin in being *nodded*-to on the Manolo’s shoe blog! Please make one for me! It’s times like this I wish I wasn’t a fashion school drop out. This dress jacket combo is the perfect alternative to a suit, well in my mind anyway.I’m not sure what would happen if I showed for an interview in this ensmeble (minus the pill box hat) but I think it could be magic! Oooh, helen, post a picture of your William Morris dress!How cute would that dress be in this? or hello! dots?Will you be making the jacket any time, erin? Erin, I think it’s more of a lavender – especially since I have a circle skirt in the same fabric, and not the same colour. And you can’t have looked as eggy as the time I wore a pink vest and skirt, with a purple shirt under it. I thought it was great in the morning, and it got eggier and eggier as the day went on. I do have a beautiful piece of ashes of roses, and it’s much greyer. Every time I look at it, I wish it was pinker, but the hand on it is wonderful.I think you can probably make up to 665 versions of the same pattern before anyone says anything. Once you go over that, somebody’s bound to say, “Hey, you know, you’ve made 666 versions of that! Does that mean something?” *wink* *wink* *nudge* *nudge*Then you can look at them coldly and say, “Yes, it’s something special for the Apocalypse. And just look at what you decided to wear.”As for me, I’ve taken it one step further. I bought a bolt of black wool crepe, since I found myself with about fifty black wool crepe jackets, all different, and had nothing that matched. Now I’ll have a kajillion black crepe suits, all different. I love the dress & the color Erin. Ashes of Roses I have a perfume by that name. I have a zillion pairs or Mary Jane shoes so my husband says. If it works it works nothing wrong with owing the same style dress in different colors & fabrics. Kinda like if the shoe fits buy it in every color. Oooooo I really really like it. I want it! It’s like the perfect dress! *sigh* REALLY darn wish I had enough skills (or time) to sew dresses. Would love to post the skirt but have no webspace or such – how do i do it? 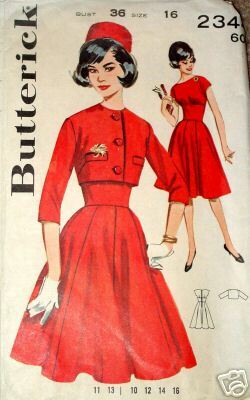 it’s such a lovely print!About to make a gorgeous 1940s pattern called ‘pretty dress’ (ebay special) for the third time for my bro’s wedding. First time in 1930s cream,rust and brown print silk, second time in navy and cream spot viscose and now in gold lace with pale pink sash. 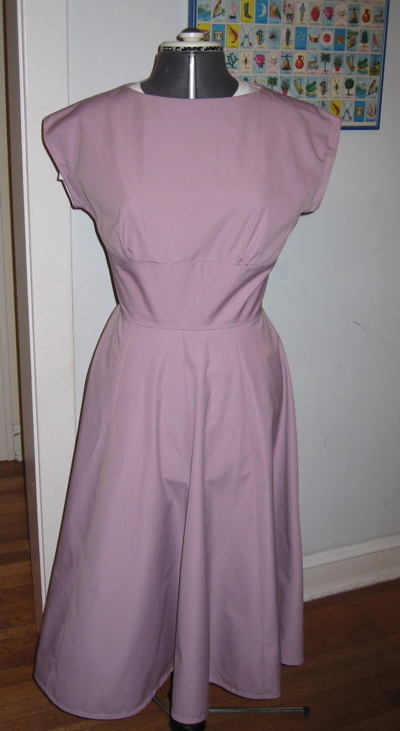 Dressmaking can be so hit and miss, if you know something works, there’s so much less room for upset and waste! I just pulled out some stationery I’d purchased at Anthropologie and realized that one of the patterns included is that red dress.just thought it was neat! I love it! I say make it as many times as you want. Once you find something that works, might as well have one in every color.